I’m all for clean slates. I always look at the beginning of a new week or a new month as a brand new opportunity. A new year has even more of that clean, white, not yet been used, new notebook feeling of hopefulness. What I especially like is entering a new year with a positive outlook, even when things don’t look so positive. The way I see it, it’s all in the frame of mind. There are no negative situations, only opportunities and chances for improvement. Maybe it’s only semantics, but I think “goal” sounds more positive than “resolution.” Resolution reminds me of something offered up at a New Year’s Eve party after one too many glasses of punch. A goal indicates a long-term plan for the future. Instead of raising my glass and offering a few hurried wishes for the New Year, I like to take some time to sit down and record my goals for the upcoming year. As I write, I also bullet out an outline or plan on how to achieve my goals. I may even use my editorial calendar to set up some steps and actions to take throughout the upcoming weeks or months so I don’t forget my goals. Everyone faces bad spots. We all have rough times. We all have to deal with negativity or bad publicity. Don’t even try to take the entire weight of it all at once. Tackle each challenge one at a time. It’s so much easier to see the light at the end of a tunnel when you’re organized and approach each task with focus and determination. Multitasking simply means you have your attention scattered in several different directions. Identify the source of negativity or the one thing keeping you from completing your goals and list all the things you need to do to render it obsolete. Don’t procrastinate and don’t say “I can’t.” Identify and act. Life always looks better when you look at the bright side. A positive attitude does wonders for even the most negative situation. Many of the obstacles in our way are all in our mind. Count your blessings. List your assets and strong suits. Know what makes you stand out from the rest. It’s good to be thirsty and it’s good to want more. Know that having a glass that isn’t quite filled to the top isn’t a bad thing. Look at the bright side and remember there’s always room for improvement. Make it a goal to fill your glass a little more with each coming year. 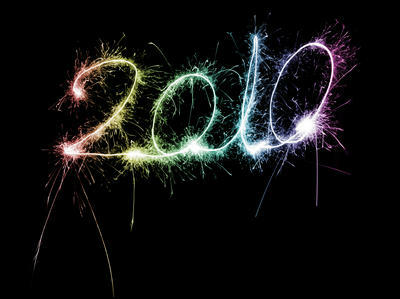 How will you be making a positive start for 2010? I wish your blog had a LIKE icon like FB. ‘Cause this is a definite LIKE. Thanks Allena, actually we’re working on a thumbs up or voting thingie for each post. Thank you for this Deb!! I have been wanting to change from making resoultions that I don’t keep to goals and your post is a definite sign:-) Looking forward to that LIKE button.. Sometimes, I don’t have the time to comment bt I would surely have the time to vote things up!! Deb, Your awesome. Thanks for being a part of my year with your hard work on this site. Thanks fot the excellent article. Yes, to run in life one should always a have positive outlook and postive action. A freelancer writer life is very difficult full of pits and drains.